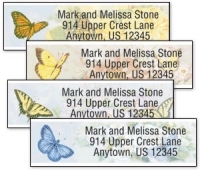 Great address label designs can come in small packages - such as ladybugs, Think Wild bees, frogs and assorted creepy-crawlies. Close up, they are gems of Nature that result in colorful designs to put on your correspondence. Ladybugs have become classic among designers of all kinds of products, but keep looking and find how truly beautiful dragonflies and caterpillars can be. A comic approach to bees might be your choice and if it isn't, there also is a realistic photo of a bumble bee at work in the flowers. A praying mantis almost provides comic relief with its gangly arms and legs and there also is a pleasant contrast of color and form in a caterpillar. You choose.